On Wednesday evening Oct 3rd 2007 ) I made my first visual observation of C/2007 F1 LONEOS in the NW evening sky from 20.21-20.55 BST using a 8.5" F/7 dobsonian reflector with 32mm 1.25" eyepiece. The comet is currently passing eastward through Coma Berenices and tonight it could be found within the naked eye open cluster known as Melotte 111 (or Collinder 256). I first located the cluster in 10x50's then guided the scope in that direction and began sweeping above the treetops in a vertical fashion when I found the comet within 5 minutes and was surprised just how easy it was. I estimated the coma at 3' in dia and a D.C value of 6. The coma is circular and compact sporting a white central region. I thought I could detect a hint of green colour during moments of good seeing. No tail was observed although I did see a stellar false nucleus in the 9.7mm occular. I agree with the current magnitude estimates which place the comet at + 7.5. I watched it set behind treetops along with a bright field star which was quite close to the comet. I can tell from the physical appearance of LONEOS that this is going to be a very nice comet - This my 40th comet. Observation made from back garden. 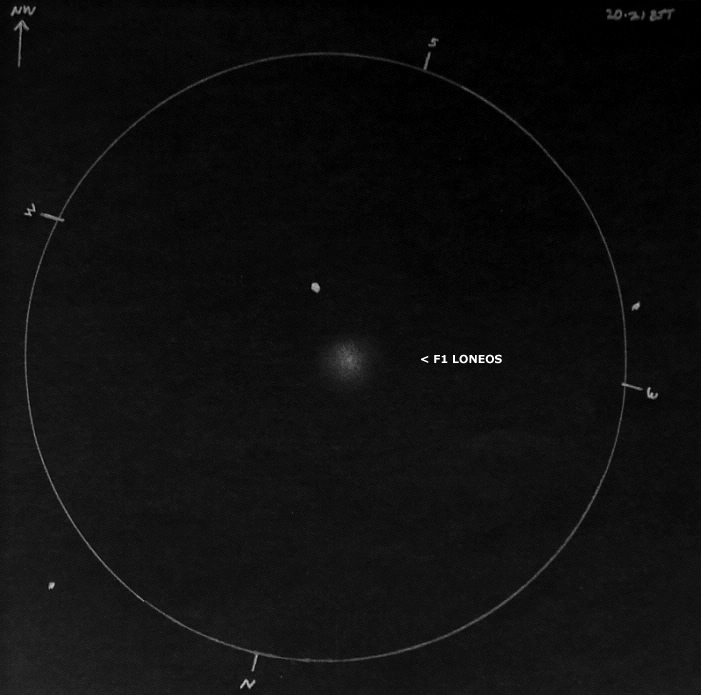 This is the first visual observation of LONEOS from Ireland. Martin Mc Kenna.